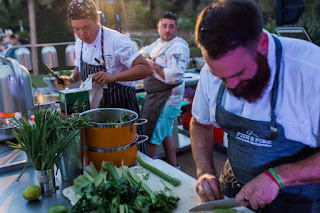 In celebration of the event's fifth year, chef Wardynski will re-join the competition, together with five returning chefs who have also competed in past Fish to Fork events. "It is an honor to cook alongside these accomplished chefs who I truly admire and feel will best represent the identity of Amelia Island," said Wardynski. "The food that we deliver to guests attending Fish to Fork will feature the flavors of the island, but also highlight our individual styles." During the evening, guests will taste and vote on the items prepared during both the Individual Challenge and Team Challenge to determine the winners. The competing chefs will also vote to determine the Chef's Choice winner. Daven Wardynski, executive chef, Omni Amelia Island Plantation Resort (Amelia Island, Fla.) Host and competitor in this year's Fish to Fork Event, Wardynski has received multiple honors from the American Culinary Federation for his passion for local, fresh, quality ingredients. Waylon Rivers, executive chef, Black Sheep Restaurant (Jacksonville, Fla.)Rivers is known as one of Jacksonville's most respected and innovative chefs. Kathleen Blake, owner and chef, The Rusty Spoon (Orlando, Fla.)Last year, Blake was one of 21 recipients in the inaugural class of the James Beard Foundation Women's Entrepreneurial Leadership program. Joey Ward, executive chef, Gunshow (Atlanta, Ga.) Ward was named one of Zagat's "30 Under 30 People Redefining the Hospitality Industry." Shuai Wang, owner/operator, Short Grain food truck (Charleston, S.C.)Wang has received praise for his untraditional Japanese cuisine and is an Eater Young Gun winner. Richard Jones, executive chef, Green Door Gourmet (Nashville, Tenn.)Jones is credited with helping change the face of true farm to fork dining in real time with consumers and chefs across the Nashville foodscape. Raffle proceeds collected during the event will benefit Omni Hotels & Resorts' Say Goodnight to Hunger program. Omni Amelia Island Plantation Resort at 39 Beach Lagoon Road in Amelia Island, FL is just north of Jacksonville and nestled between the Atlantic Ocean, lush marshlands and the Intracoastal Waterway. Alongside 3.5 of beachfront, the property is situated on 1,350 acres. The resort features 402 guest rooms and suites, over 300 one-, two- and three-bedroom villas, 80,000 square feet of meeting space, 10 restaurants, the largest oceanfront poolscape in Northeast Florida, 36 holes of championship golf, 23 tennis courts, a fitness center, a luxurious full-service spa and salon, a shopping village with 14 boutiques, and numerous other recreational activities. For information, visit omniameliaislandplantation.com or call 1-800-THE-OMNI (843-6664). Like Omni Amelia Island Plantation Resort on Facebook and follow the resort on Twitter.